Over 3,500 people died in Sierra Leone after the highly-contagious virus spread through the country and neighbouring Liberia and Guinea in 2014. Over 11,300 people died from the disease in the three countries in the period between March 2014 and November 2015. A country must have no new infections for 42 days to be declared ebola-free. Sierra Leone is expected to reach this milestone on 7th November. An estimated 12,000 children were made orphans by ebola, according to reports in March 2015. Others have been separated from parents, become malnourished or face stigma if the disease affected their family or they survived it. Children were out of school for nearly a whole academic year. Caritas provided school fees, school kits, books and recreational activities, reunification packages for families and tried to maintain some constancy. Food production went down in Sierra Leone as farmers abandoned their farms and some border crossings were closed to stop the spread of the disease but also preventing the entry of migrant farm workers. Caritas has been providing cash grants, seeds and tools to get people back to work. Caritas has given food, hygiene items and counselling to people affected by ebola and their families. Caritas and the local Church has worked on various levels to help local communities deal with the ebola epidemic. A key part of its work has been awareness raising regarding hygiene practices and involving community and faith leaders to prevent the spread of the disease. 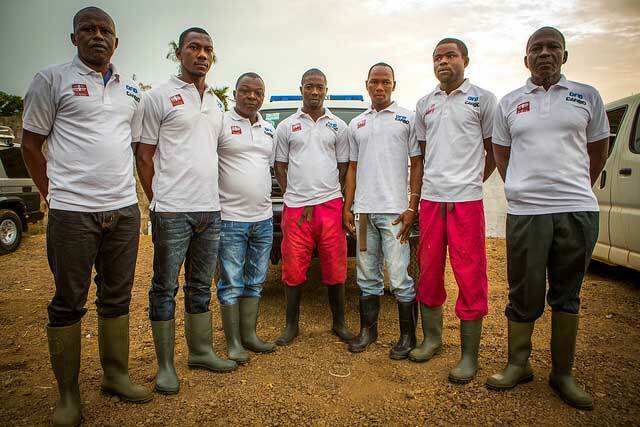 Caritas organised “safe burial teams” who ensured that people who had died from ebola had a dignified funeral but those who buried them followed guidelines to ensure they didn’t contract the disease. The poor healthcare system in Sierra Leone was weakened even further by the demands brought by ebola. In the long-term Caritas is supporting the local health structures by providing medicines and equipment to help it become more sustainable. “There is still a lot to be done but we, as a community should pause for a moment, exhale, and thank all who did what they could, in some cases laying down their lives, for our beloved Salone, [Sierra Leone],” says Fr Peter Konteh, director of Caritas Freetown. For more information, please contact Michelle Hough on +39 06 69879721 / +39 334 2344136 or hough@caritas.va.